I loved the first book in this series. I can't wait to start the second! The stunning second novel in the Starbound trilogy is an unforgettable story of love and forgiveness in a world torn apart by war. We have a giveaway going on for this book at WinterHaven. I hope you get a copy soon and enjoy it. :) Happy reading! I'm waiting on this one as well. Really loved These Broken Stars. Can't wait to see how this next story goes! This one is going to be good. I have a feeling that I'm going to enjoy this book a lot. Great choice. I still need to read the first book. Great pick! You cannot imagine how much I want this book! I know some bloggers that got it at BEA, but I wasn't that lucky :( I hope we get a glimpse of of Tarver and Lilac. Great pick! It just reminds me that I need to go read These Broken Stars. 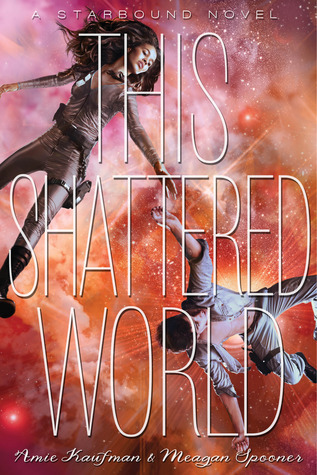 I loved These Broken Stars, and I really can't wait for This Shattered World either :) Thanks for sharing, Alison! This is on my wish list. I loved These Broken Stars and have high hopes of This Shattered World. I loved the first book in the series, too! Can't wait for this one. I especially like that these are more like 'companion novels' and less like direct sequels. I am tired to death of series! I want to read the first book! I should have picked it up. Nice! Remember a lot of buzz over the first one in this series! Hope you enjoy the second installment as well! I can't wait to get my hands on this one. It's so far way!!!! Awesome choice this week!!!! Thanks for sharing. Happy reading. Loved the first book so I know I must read this one. Not all of us know how to handle anger but there are some people who offers lessons.